Welcome to the only siren you will ever need. You have just found the least expensive yet toughest siren and speaker kit that is available on the market. If you want a simple, easy to install, easy to use, and very LOUD siren and speaker combo kit, This is THE one! Every police or fire siren that is manufactured needs a speaker. You need both(plus the wire) to be able to function. We thought it would make sense to bundle both the siren and speaker together in an affordable VERY low priced package. You receive everything you need (but the wire) to install the siren and respond to emergency calls. This is it. The Carson Siren and Speaker bundle. This kit includes a very loud and very powerful 100 watt siren. It's call the Carson SA-365. This Siren is the same loudness as the emergency vehicles you hear in your neighborhood everyday. But we also include the powerful 100 watt speaker in the bundle as well. 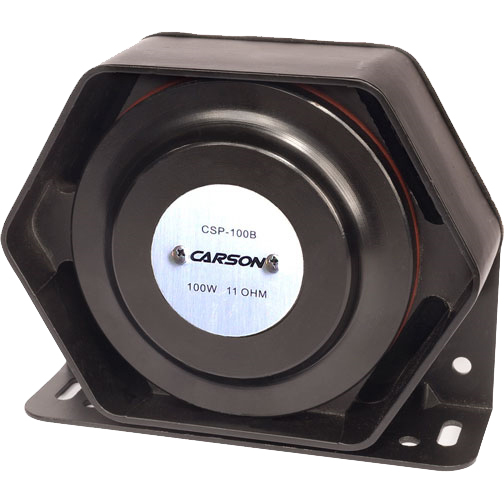 While most of our competitors are including a bell speaker for about the same price, we are the quality and price leader by offering a very compact speaker with the Carson CSP-100B. Now some of you may be asking why do I need a compact speaker and siren. First - look under your hood and see if you can find a large space to install a speaker. That is where the speaker is typically installed. Either in the grill of the vehicle or in the front of the hood compartment. With our kit, you have a small and loud speaker that you can mount virtually anywhere. That's important! Want to know the details of the Carson SA-365? Carson has went to work in the engineering department listening to it's customer's needs and delivering with an even better value. It's smaller and more compact than before and still delivering all the standard features you are used to. Never before has a police and fire siren delivered such powerful features at an affordable price. It's perfect for volunteer firefighter's who need a compact siren that can mount underneath the dash of your personal vehicle so that it can be used when you respond to fire calls and can be out of the way when your off duty. It's ease of use is also great. No big knobs just simple toggle switches that you switch between all 6 different sound functions (wail, yelp, air horn, manual, phaser). If you need a set of features on a Carson sirens unit like this, simply put, this is the siren you need to buy. Plus, with a 5-Year No Hassle Warranty that we back up - trust us - with the siren you're covered. Introducing the all new Carson SA-365 Siren. This siren replaces the Carson SA-360 Defender Siren. As with all Carson Sirens this one is made from a super duty aluminum. It's not plastic like some others you'll see. You don't have time to deal with emergency warning equipment that may break. Trust your trip to Carson. All of these features are easily armed or disarmed using internal DIP switches. The SA-360 Defender Siren is designed to work with a single 100-watt siren speaker and includes a mounting bracket, external fusing, short circuit, high voltage and reverse polarity protection systems and an output indicator light for diagnostic purposes. 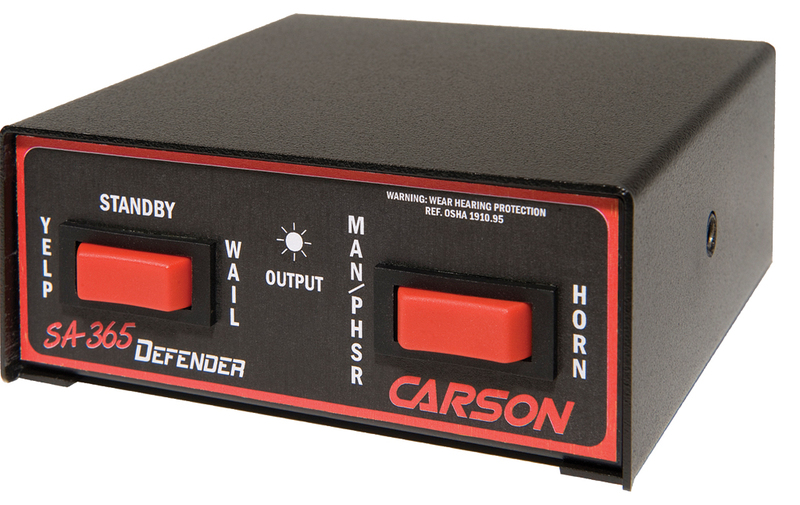 As with all Carson Sirens products, the SA-360 Defender is backed by a no-hassle 5-year limited warranty. What Does it Sound Like?? Just check out our Carson Siren Sounds Page to check out the traffic busting sounds. Amp Size (cubic inches) 28 cu. in. 99 cu. in. 45 cu. in. 88 cu. in. A powerful compact siren speaker that can mount virtually anywhere. At only 2.36 inches deep, this is our most compact siren speaker we have available. With all siren speakers the cost of the metal they are manufactured with has continued to rise. Neodynium has skyrocketed in price over the last year. We have been working very hard to find a speaker that produces quality sound yet is affordable. With the Carson CSP-100B 100 watt siren speaker, we have found just that. It's ultra compact, hexagonal shape allows for a very flexible installation within your vehicle. Delivered on time and as advertised. Simple and sturdy mounting, easy to program the many stobe patterns available. The Carson SA365 compliments my Excalibur security system. Great product!! Very loud and moves traffic. can't beat this product, compact, took 20minutes to install, no beating that! Great sound uotput, you choose from hi-lo to yelp to wail, phaser and airhorn, thumbs up! Great product and easy to install. Sounds awesome! Great on shipping, and came on time. Great on my budget. Where do I start? I am very pleased with this siren, install took an hour with my son helping. It is very loud, it's compact and works well. Only issue I had was it didn't ship as fast as I would have liked but after calling I was told the speaker was back ordered and the gentleman I spoke to apologized numerous times and promised it would be shipped that day. Lo and behold he kept his promise and I recieved four days later. I am very happy with this company and will recommend them to everyone I know. This is a great unit ! Very loud ! My son is a volunteer fire fighter and this is a perfect set up for volunteers on a budget. Amanda in customer service was very polite and helpful. I told her when we placed our order we needed it by a certain date and she said she would personally make sure the unit shipped that day even if she had to drive to the ups hub and drop it off herself ! Now that's customer service !!! This siren is the real deal. Sounds great and gets the job done. Just recently ordered the siren speaker bundle. Its easy to install actually it was a quick install. One of the loudest sirens that I've heard on a pov. I also like the size of the driver easy to conceal and mount under dash. I recommend this product to anyone that needs a siren for their pov responses. I ordered this siren thinking I would not like it. Opened up the box and was amazed at the small design. Plugged it all up and love the sounds. I would HIGHLY recommend this product. 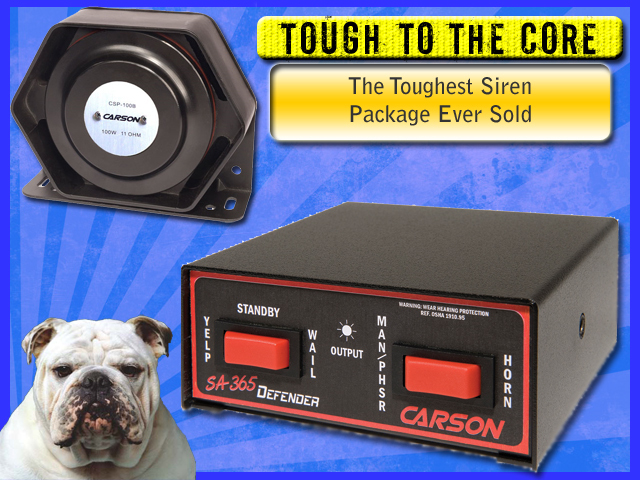 Also, TPSS has the lowest price for the siren and speaker. Thanks for the great product TPSS! Excellent complete siren set up. Very streamlined and simple. Already have cleared many intersections safely with this siren. It's loud, and has all the basic tones. If you're looking for a good, professional siren on a budget, look no further! The Best Siren Bundle on Market! this Siren is the Real Deal, This is not a toy like some of the others on market for the same price! When I was searching for a siren and speaker kit for my truck - I looked all over and tried to find the cheapest. This is the best value I could find. Anything cheaper than this and you are dealing with toys - not sirens. I found this one and emailed these guys. They responded quick like they said they would and even sweetened the deal. This is perfect for any firefighter who wants to get a siren for the truck or car. I would recommend this one to anyone. I have never seen a good product like this go for the price. This is one good deal. I got it and with the instructions it's easy to install and boy is it loud. All my firefighter buddies are coming buy to buy this now. I put this on my truck and ita louder than a fire truck. I love it and it moves traffic like no other siren I have ever had. You should buy this !!!!!!! !